We just got back from Disneyland, and our kids were OBSESSED with the Mickey Mouse Caramel Apples. To get over our post trip blues, we decided to make our own at home! 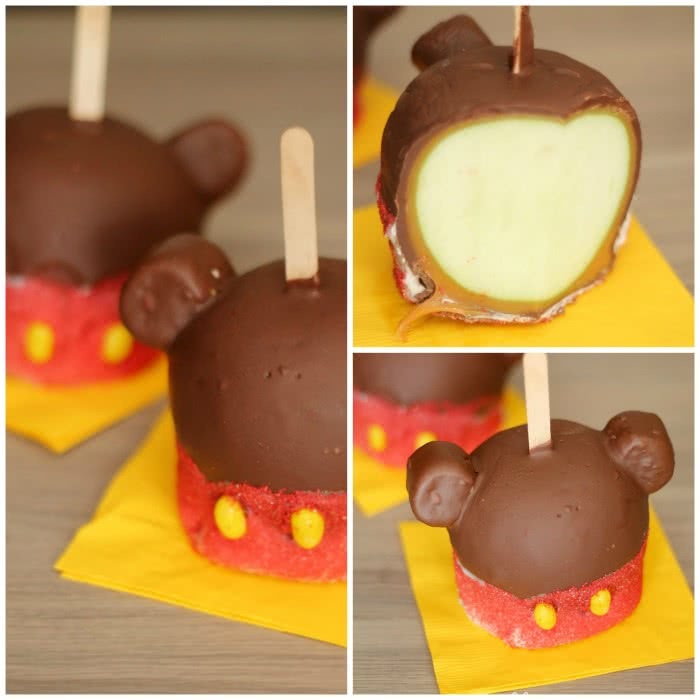 Make your own delicious Mickey Mouse Caramel Apples at home! Push popsicle sticks into the center of each apple. Cook caramels and water in a large saucepan on medium-low heat until caramels are completely melted, stirring constantly. Dip apples in caramel until evenly coated, letting excess caramel drip off. Scrape caramel off the bottom of the apple and place on a baking sheet covered in wax paper and sprayed with nonstick cooking spray. While the caramel is still warm, trim the bottom off each marshmallow to create a flat surface and place near the top of the apple to create ears. Place baking sheet with apples in the refrigerator for an hour, or until caramel is set up. Melt chocolate chips in the microwave for two minutes, or until melted. Stir until smooth and dip each apple entirely in the chocolate. Gently shake off excess chocolate and place back on the baking sheet. Return baking sheet with apples to the refrigerator for 30 minutes or until chocolate is set up. Melt white chocolate chips in the microwave for two minutes, or until melted. Dip the bottom half of each chocolate apple into the white chocolate. Shake off the excess and place two yellow jelly beans on the front of the lower half of the apples to create buttons. Using a large spoon, sprinkle red sugar crystals on the apple until all of the white chocolate has been covered. Place on baking sheet and let set until hardened.